On August 4, 1958, Billboard put Ricky Nelson’s “Poor Little Fool” atop a brand-new chart it dubbed the Hot 100. Prior to that, the industry had relied on a shaky system that aggregated record store sales, radio DJ spins, and jukebox plays to measure a song’s popularity. The Hot 100 finally put all of those competing metrics into one streamlined, genre-crossing place. And 60 years later, while record stores, radio DJs, and jukeboxes have all mostly gone the way of Ricky Nelson, it still remains in use, influencing label decisions and governing artists’ careers, even as changes in how music is released and consumed only further expose its limitations. The Hot 100 has long reliably served as a capsule of an era: These are the songs and artists that Americans were into that year, at that specific time. But just like its statistical shortcomings, those snapshots are often woefully incomplete. (Think about all the songs you loved in 2017; unless two of them featured Ed Sheeran, the Hot 100 probably doesn’t reflect your year at all.) 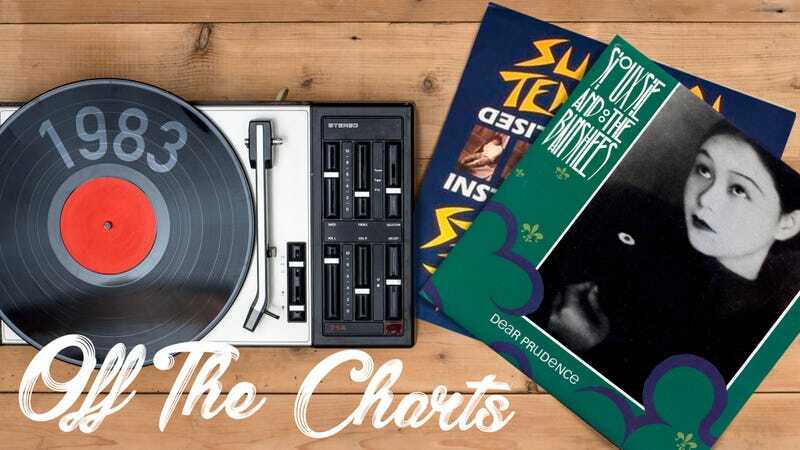 In this new biweekly column, Off The Charts, we’ll revisit each year since the Hot 100 was established to spotlight songs and artists that didn’t make the cut to be considered “hits,” but that still had a significant impact—and in many cases, capture their respective times better than the songs that did. To keep things interesting, we’ll be choosing each year randomly—and to make it even harder on ourselves, the rules for inclusion are that the songs and albums they hail from didn’t even make the Billboard 200. Selections will be argued over, in some cases spitefully, by our staff, and then listed in order of release. (We’re not gonna even get into trying to rank them.) Admittedly, it’s not a perfect system, and lots of great songs will still be left out. But of course, the same can be said about the Hot 100 itself. Is there a more quintessentially “80s” year than 1983? Nearly all of the top songs from this year are obligatory choices for any self-respecting dance club’s retro night—and lying just outside the Top 20 are fellow instant era-signifiers like “99 Luftballoons,” “She Blinded Me With Science,” “Electric Avenue,” “Africa,” “Little Red Corvette,” “Mickey,” “The Safety Dance,” etc. If you were a director looking to soundtrack a flashback montage, you’d start here. From Billboard’s Top 20, we can discern a few trends: the lasting dominance of Michael Jackson’s Thriller, which charted an unheard-of five singles that year. The phenomenon that was Flashdance, whose soundtrack yielded two Top 10 songs (“What A Feeling,” “Maniac”) and probably boosted another tune that touched on similar themes of women giving it their all (“She Works Hard For The Money”). A lingering ’70s love of syrupy, slightly overblown R&B and soft-rock ballads whose melodies you now only dimly recall. The near-total banishment of capital-R rock. And more than anything, a predilection for songs for—and about—dancing. More generally speaking, the singles and album charts from 1983 reveal the mainstream incursions of new wave—The Police, The Human League, Eurythmics, Duran Duran, U2, Talking Heads, Tears For Fears, Naked Eyes, Big Country, The Fixx, and Culture Club all sold big that year—and heavy metal, which crossed over into pop via charting breakthroughs by Metallica, Def Leppard, Mötley Crüe, Quiet Riot, and Accept, even as its future was being mapped out in debuts by the likes of Slayer, Queensrÿche, Mercyful Fate, and Pantera. This was also a big year across the board for female artists, with Irene Cara, Bonnie Tyler, and Donna Summer’s pop reigns buttressed and challenged by hits from the likes of Madonna, Cyndi Lauper, Laura Branigan, The Pointer Sisters, Nena, Stevie Nicks, and The Pretenders. But as usual, the most interesting, influential stuff could be found on the margins—in the so-called “college rock” landscape (just making itself known through the surprise chart success of R.E.M.’s Murmur), as well as in the U.K.’s vibrant crop of new wave bands and in America’s fertile, widespread punk scenes. And while hip-hop had something of an off year—one of its few big releases hailed from Malcolm McLaren, of all people—there were hints of the coming explosion in underground recordings by the likes of Run-DMC, Too Short, and the Beastie Boys. It’s no surprise that our alternate Top 20 reflects these outliers, a version of the “80s” that lasted long after the novelty hits wore off.